As Tulane faculty, you are on the "front lines" of the University's mission by "cultivating an environment that focuses on learning and the generation of new knowledge." We are here to help you and answer your questions. Please see if we've answered them here. And if not, contact us. Tulane University health plans offer the same coverage. You decide if you want to may more in premiums up-front or through higher deductibles and co-insurance. Available health plans are Low, Middle, or High through United Healthcare. To read about the different plans click here. When can I contribute to a retirement plan? All eligible employees will begin participation in one of our two retirement plans on the first day of the next payroll period after completing two (2) years of service at the University. Plans offered by: TIAA-CREF and Fidelity. All faculty and their dependents are eligible for to participate in the Tuition Waiver Program the date of hire. (More Information | Forms: Employee or Dependent). Graduate-level tuition waiver for University employees can be provided on a tax-free basis up to $5,250 annually. The value of your tuition waiver in excess of $5,250 is taxable income and will be reported on your W-2. 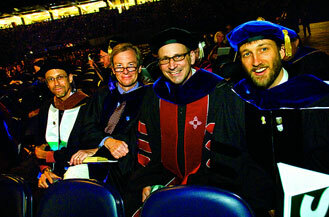 Tulane faculty continue to teach and do research of extraordinarily high quality and impact. The faculty at Tulane University number over one thousand strong. We say "strong" because our faculty has helped lead Tulane to national accolades: one of Newsweek's nine "hot schools" as well as ranking within the top 50 national universities according to U.S. News and World Report. But we also mean "strong" because that same faculty has ridden out one of the toughest times in U.S. history for a university and a community–Hurricanes Katrina and Rita. This extraordinary group continued to educate, communicate and quite often house and feed Tulane students during the unprecedented evacuation of New Orleans in August 2005. And they are still working every day to continue a tradition of excellence at Tulane. Universal Employee Definition – Faculty: Employee holds a faculty appointment and is engaged in scholarly pursuits (i.e. education, research or clinical practice).